In the 1950s and 1960s, General Motors ruled the automotive world. Their market share in the United States was over 50%. Each of their brands (Chevrolet, Pontiac, Oldsmobile, Buick and Cadillac) was the benchmark in its market segment. Product planners at Ford and Chrysler could only hope to anticipate GM’s next move, plan as best they could, then hope the marketplace responded. Today, it’s hard to imagine a car company with the creativity of GM during that period, whether in styling or tech. Early ‘50s: Three different automatic transmissions — Powerglide for Chevy, Dynaflow for Buick and Hydramatic for the others. Engines: OHV for Cadillac, “Nailhead” for Buick, small block for Chevrolet, air-cooled flat-six for Corvair, OHC for Pontiac 6. In style: Finned Cadillacs, porthole Buicks, Corvair, Toronado, Riviera, El Dorado. From every standpoint, GM led the world. Over the next 30 years, it all went wrong, nowhere more than its product design and execution. One of the most successful private capital enterprises suddenly couldn’t do anything right. 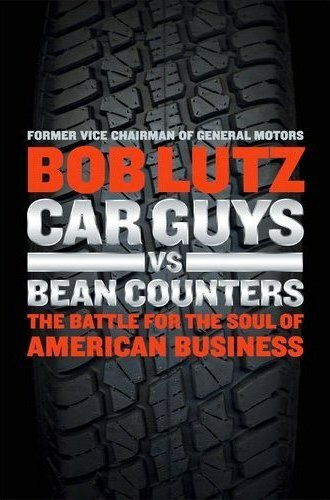 Former GM Vice Chairman Bob Lutz’s autobiographical book, titled Car Guys vs. Bean Counters: The Battle for the Soul of American Business, tells what he found when GM hired him as “product czar,” and what he did about it. He describes a company mired in policy and procedures, meetings and compromises. By the time a car came to market, it was doomed to fail because it had been over-studied, compromised to death and delayed, so it was obsolete, bland and flawed when it was finally produced. No one ever suffered for these failures; no one ever got fired or demoted. Lutz changed all that. In spite of their looming bankruptcy, he drove the planners to create some desirable cars. It was too little, too late. But post-bankruptcy, the surviving brands each have something to sell that buyers want. The big question, now that Bob has retired, is whether the lessons he taught will be remembered. Martin Swig is a San Francisco-based vintage racer, car collector and founder of the California Mille vintage car rally. A graduate of Stanford University, Swig was a multi-franchise new car dealer in San Francisco for 40 years. In addition to founding the storied California Mille in the early '90s, Martin has been vintage racing a variety of mostly Italian marques for more than 30 years. The lifelong car collector drives an Audi S5, Audi S4 Avant and Mazda Miata on a daily basis, in addition to routinely exercising his collection of vintage Italians.